The clocks have gone back, the days are shorter and most of us are stuck in offices during the brief periods when the sun decides to make an appearance. The commute to work is dark. The trip home, also dark. It’s freezing, and everyone around you is sneezing and coughing. Winter can be a nightmare and we all long for the summer back. However here are a few tips to survive the harsh winter winds and bitter downpours. Admit it… in the winter you like to stay wrapped up warm in bed or you turn into a couch potato! You need to try twice as hard in the winter to exercise as you probably don’t want to go outside. So why not do a bit inside first to warm yourself up and then venture outside to finish of your routine. Winter isn’t exactly the happiest of seasons, whether you suffer Seasonal Affective Disorder (SAD) or not. Focus on all the positive things about winter and soak up as much natural sunlight as you can. 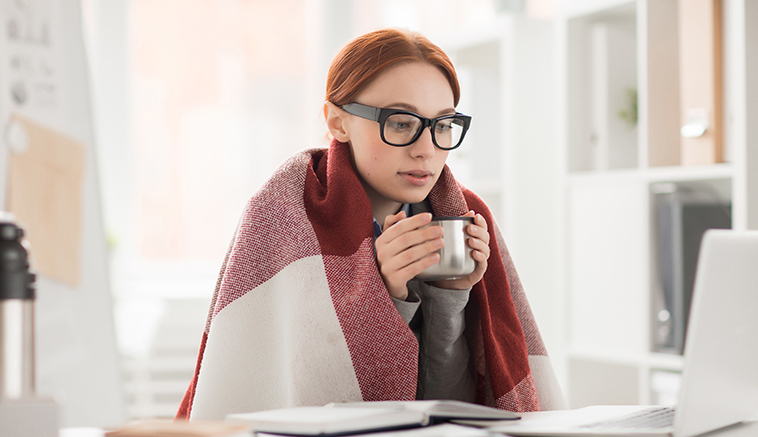 Make sure you take extra special care if you work from home, cabin fever-like effects kick in making winter’s depressing nature even worse. Cold temperature and snowy weather may seem like winter’s biggest downers, but the dry air can also cause lots of annoyances. Your skin and eyes will probably be a lot drier in the winter months, so make sure you take extra care of them. Cover up your face and eyes and use a good moisturiser. The most obvious advice is if it’s too cold where you live, go somewhere else. So why not take a little off-season holiday? Even a 10-day reprieve will help you relax. Cold weather may not directly cause colds, but cold season is definitely in full swing. You don’t have to hole yourself up to avoid getting sick, you just need to take a little extra care; get a good amount of sleep, wash your hands often and stay active!